HOME REPORT VALUE £72,000 - EXCELLENT PRICE! This three bedroom terraced house is close to two Primary Schools and local shop. GF: Living Room, Dining Kitchen & GF toilet. UF: Three good sized bedrooms with storage and family bathroom. Residents parking to front. Enclosed rear garden with low maintenance section and garden shed. Gate leading to communal lawn section. Three ceiling lights, smoke alarm, two large storage cupboards, two telephone points. Radiator, carpeted flooring. Door to rear garden. Window to rear with curtain pole. Ceiling light and fan, TV point. 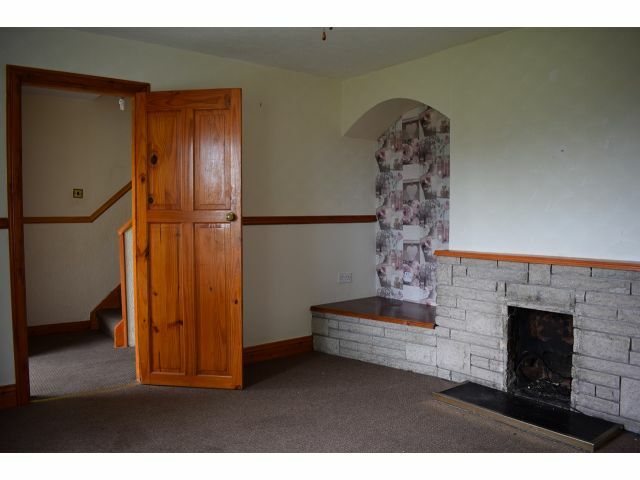 Brick built fireplace and two alcoves. Radiator, carpeted flooring. Window to front. Two ceiling lights, range of wooden wall and base units, integral oven, four plate ceramic hob and cooker hood extractor. Sink and drainer with mixer tap, plumbing for washing machine. Tiled splashback. Space for table and chairs. Radiator, laminated flooring. Window to front. Ceiling light, toilet and wash hand basin. Radiator, vinyl flooring. Loft access. Ceiling light, smoke alarm. Storage cupboard, balustrade. Carpeted flooring. Window to front with blinds. Coving, ceiling light, TV point. Double built in wardrobes with hanging and shelving. Radiator, carpeted flooring. Window to front with curtain pole and Velux window. Ceiling light, double built in wardrobes. Radiator, carpeted flooring. Window to rear with curtain pole. Ceiling light, built in double wardrobes. Radiator, carpeted flooring. Window to rear with curtain pole. Ceiling light, radiator, carpeted flooring. Velux window to front. Ceiling light, wood panelled ceiling, tiled walls. Three piece suite comprising of toilet, wash hand basin and corner bath with over head shower. Radiator, vinyl flooring. Offers in the region of £63,500 are invited and should be submitted to lj Residential, 93 High Street, Annan, DG12 6DJ or by fax to: 01461 205037.